A crucial shipping route for commodities, the Mississippi River faces climate-related risks that also raise important national security issues. The Mississippi River is a critical shipping route in the United States. Wheat and corn, construction materials, coal and petroleum, chemicals and other goods are shipped on the river. That’s retired Army Brigadier General Gerald E. Galloway, now an engineering professor at the University of Maryland. A major disruption of the Mississippi could devastate the United States’ economic and national security. The two are intrinsically linked — economic power gives the U.S. greater clout in global affairs. But natural ebbs and flows in the river’s water level and the aging infrastructure of locks and dams make it harder for barges to navigate. Extreme weather such as floods or drought, intensified by climate change, could add pressure to an already stressed system. 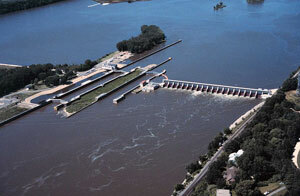 Photo: Mississippi River Lock and Dam No. 2, near Hastings, Minnesota (source: USGS).